Virno functions as resource for the Target of our CATTt. 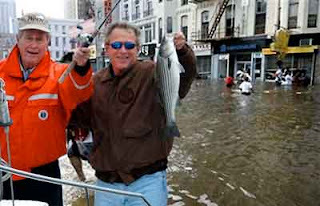 An immediate connection with this dimension of public policy disaster is his allusion to Hurricane Katrina through the metonym of the "Superdome." A number of the students missed this allusion in their notes. A theory of institutions that seeks to abandon the paradigm of sovereignty, without eluding the question of intraspecies aggression, must place at center stage that inviolable weaving together of the three levels on which human praxis is articulated: a) regularity, or "the common behavior of mankind"; b) defined rule; c) application contingent upon the defined rule. None of these levels (and even less so, the application) constitutes a free zone, immune from so called "evil": all these levels are a theater for the oscillation between the good life and the Superdome of New Orleans (Virno, 36). The concern of Routine (in a project to place well-being at the center of electrate thought) must take into account Virno's observation, that virtue and evil emerge from the same capacities and faculties of human potentiality. The oscillation signals we are in a threshold condition of cultural turbulence. The Real speaks through the Superdome figure, intimating the catastrophe of winner-take-all values emblematized in this sports arena. 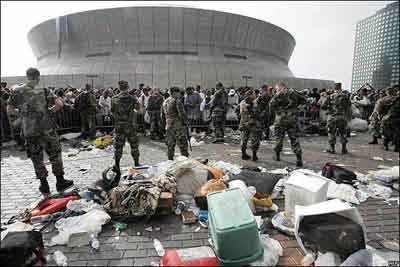 The natural and social disasters manifest at the Superdome allude to a further disaster of hypercompetition, the dangers of Entertainment as the site of emergent electracy. Meanwhile, this scene is associated with a viral appropriation still in circulation, a photoshop joke, proving that a cliche (Nero and his fiddle) is also an archetype.